India's highest gallantry award, param vir chakra (PVC) is honoured to those brave soldiers who have fought courageously and have shown extraordinary bravery and supreme sacrifice in the battle field. 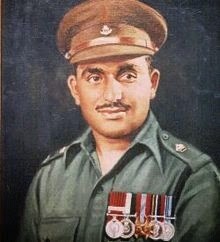 One such brave soldier is major somnath Sharma, the first recipient of param vir chakra. On 3rd Nov, 1947 Major Somnath Sharma was awarded with param vir chakra to Honor his supreme sacrifice for the nation. He was born on January 31, 1923 in dadh, kangra himachal Pradesh in a well known military family .His father was major general amar nath Sharma who was also a military officer and was retired as the director of medical services (army) as were his brothers Lt. General Surindar Nath Sharma retired as engineer in chief and general vishwa nath Sharma retired as chief of army staff (1988-1990) and his sister major Kamla Tewari also a medical doctor. major somnath Sharma did his schooling from Sherwood college , nanital and later he joined the prince of Wales royal military college in dehradun and then later on he joined the royal military academy .then major somnath Sharma was commissioned into the 8th battalion, 19th Hyderabad regiment ,later 4th battalion ,kumaon regiment of the Indian army then British Indian army on 22 Feb 1942 .major somnath Sharma life from his childhood till his last breath revolved around army which could be one of the reason for major somnath Sharma passion for army and for serving the country . he never feared from his death and always look forward in serving the country. Major Somnath was a born warrior, as inspite of his injury he fought the war courageously till his last breath. Major Som nath Sharma was only aged 24 when he was killed in action while evicting Pakistani infiltrators and raiders from Srinagar airport during the indo-pak war of 1947-48 in Kashmir on 3rd November 1947 at badgam, India. On 22 October 1947, Pakistan launched the tribal invasion of Jammu & Kashmir. The intention was to grab the Kashmir valley by force. As the State became a part of the Union on October 26th, her protection became the responsibility of India. To save the State from a tribal invasion, which was approaching the valley at a very fast pace, India dispatched troops to Srinagar. The first batch of Indian troops reached just in time on October 27Th morning to stop the enemy on the outskirts of Srinagar. The D Company of 4 Kumaon, led by Major Somnath Sharma, was airlifted to Srinagar on October 31st. 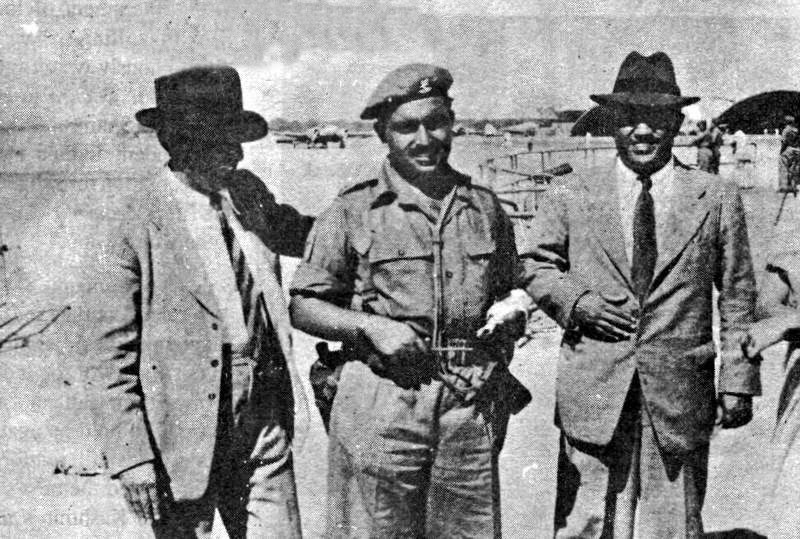 When his company was asked to move to Srinagar, Major Sharma's arm was in plaster. He had suffered a fracture on the hockey ground and was advised rest till the plaster was removed. But he insisted on being with his company at this crucial hour and was allowed to go. Meanwhile, the main thrust of the tribal invasion of Srinagar had been blunted by the 1 Sikh at Patan. The enemy now resorted to guerrilla tactics to sneak into the valley. But the induction of more troops into Srinagar enables the Army to take care of the surrounding areas better. On November 3rd, a strong fighting patrol compromising 3 companies was dispatched to reconnoitre the Bagdam area to look for raiders approaching Srinagar from the northern direction. By 0930 hrs the troops had established a firm base at Bagdam. AF aircraft to their targets in the face of enemy fire. The company held on for six hours against heavy odds. When heavy casualties adversely affected the firing power of the company, Major Sharma, with his right hand in plaster, took upon himself the task of filling the magazines and issuing them to men, operating light machine guns. While he was busy fighting the enemy, a mortar shell exploded on the ammunition near him. His last message to Brigade HQ, received a few moments before he was killed was, "The enemy are only 50 yards from us. We are heavily outnumbered. We are under devastating fire. I shall not withdraw an inch but will fight to our last man and our last round." Major Somnath Sharma was a proficient officer, he had fought in post independence British Indian army in World War II and in Indian army during the Indo-pak war of 1947 where he has shown extremely extraordinary bravery and have created history by becoming the PVC recipient. In the battle of Bagdam, Major Sharma, one JCO and 20 other ranks were killed. But their sacrifices did not go in vain. He and his men stemmed the tide of the enemy advance on Srinagar and the airfield for some very crucial hours. He has set an example of courage and qualities, seldom equaled in the history of the Indian Army. 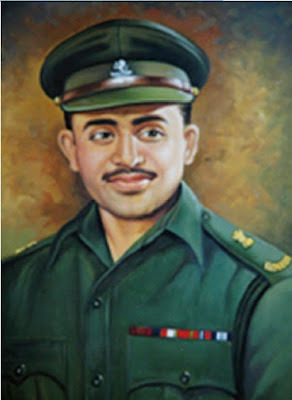 Somnath Sharma had given best of his services from 1942 to 1947 in serving the nation, His father Major General Amarnath Sharma received India's first and highest war-time gallantry medal, Param Vir Chakra, on behalf of his brave son. 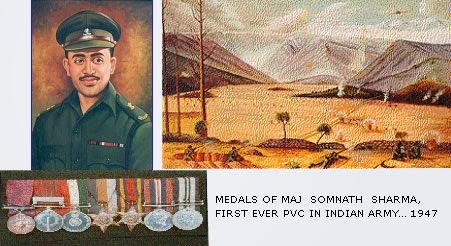 Major Somnath Sharma was also the elder brother of the son in law of savitri khanolkar, who designed the PVC.